Follow in the footsteps of Rick Stein and take a gastronomic journey along the sun-drenched Canal du Midi through the south of France on board beautiful Anjodi. See the magnificent Archbishop's Palace and Via Domitia in the Roman capital of Narbonne, explore Minerve with its 12th-century Cathar fort, and discover the fortified city of Carcassonne. From the lovely fishing village of Marseillan, cruise through the picturesque Bagnas nature reserve to Pezenas, renowned for its associations with French playwright Moliere. Cross the impressive aqueduct and ascend the spectacular 7-lock flight of Fonserannes, and enjoy a winery tour and tasting at the 14th-century Chateau de Perdiguier. Attending to your every need is a Captain to manage the barge, a master chef to create delicious meals, a housekeeper and a knowledgeable tour guide. Bicycles are also available for exploring independently. 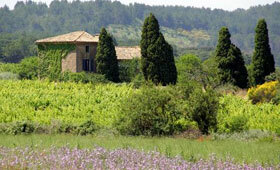 Guests are met in Narbonne and transferred by private chauffeured minibus to Anjodi. Enjoy a chilled Champagne welcome with canapés and the opportunity to meet your crew, followed perhaps by a relaxing stroll around the lovely village. Dinner on board. This morning, we cruise to Capestang, passing vineyards and pine trees, with magnificent views of the Pyrenées along the way. There is time to explore the village, once the summer retreat of the Bishops of Narbonne, with its magnificent 14th century collegiate church. After lunch on board, our excursion is to Minerve, the ancient capital of the Minervois, which boasts a 12th-century Cathar fort surrounded by deep limestone gorges. Besieged by Simon de Montfort in 1210, its hilltop location affords spectacular views and the museum’s fascinating miniature recreation of the bloodthirsty Cathar rebellion completes the intriguing picture. Dinner on board. This morning we visit Narbonne, a Roman Mediterranean capital where the Visigoth monarchs once lived. We tour the Archbishop’s Palace, Cathedral and Via Domitia and explore the indoor market at the hub of this bustling town, where you will have time to shop or simply absorb the vibrant atmosphere of this lively town, where you will have time to shop. We return to the hotel barge for a cruise via the world’s oldest canal tunnel at Malpas, perhaps pausing en route at the Poilhes brewery for a tour and tasting, to our mooring in the pretty village of Colombiers which lies on an old Roman road, the Via Domitia. There may also be time to view the star-shaped fields and the 13th-century irrigation channels of Montady from L’Oppidum d’Enserune. Dinner ashore tonight at a gastronomic restaurant in Beziers. After breakfast, we cruise to Fonserannes and descend through the unique flight of 7 oval locks, before crossing the aqueduct over the River Orb to moor in Portiragnes where the Canal du Midi is at its closest to the Mediterranean. For those who are feeling active, the beach is only 20 minutes away by bicycle. This afternoon, we enjoy an informative winery tour and tasting at the 14th-century Château de Perdiguier, named after King Charles V’s finance minister and famed for its frescoes and Cabernet Sauvignon, Pinot Noir and Chardonnay wines. Dinner on board. This morning, Anjodi sets off through the famous round lock and then the nature reserve of Bagnas, with potential sightings of flamingos, white egrets and other migrating birds before heading out onto the inland saltwater lake of Thau, past the oyster beds. After mooring in the fishing village of Marseillan, home of Noilly Prat vermouth, we take an excursion to Pezenas, the delightful 16th-century capital of the Languedoc mostly known for its associations with the French playwright Molière. On the way back to the barge, there is the option to visit a local oyster farm to sample its delicious produce with a glass of white wine while enjoying a view of the oyster beds. Captain’s Farewell Dinner on board. PLEASE NOTE: This itinerary runs in reverse on alternate weeks. It is a sample itinerary and is subject to change.